Every whisky wants to be regarded as "iconic" but how many truly fit the bill? Whether we like to admit it or not, marketing stories are important and they work. Bourbons love to proclaim their connection (real or manufactured) to the American spirit of independence. (Never mind the fact that 8 distilleries produce the vast majority of all bourbon on the market). Scotch whisky distilleries love to incorporate Gaelic names as well as references to defying English tax-collectors by engaging in illicit distilling. Lagavulin 16 Year Old doesn't have to make these claims, as far as I'm concerned. Their tagline could be "This is Lagavulin. It tastes fantastic. You should buy it." and I doubt its sales would suffer. 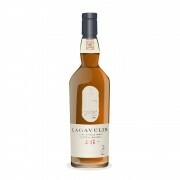 Lagavulin 16 is Ron Swanson's whisky of choice. Heck, I can imagine Swanson pronouncing my tagline in his signature deadpan. It would work, I'm sure of it. Not surprisingly, Lagavulin 16 is also the whisky of choice for Swanson's real life alter-ego, Nick "my beard can beat up your beard" Offerman. Finish: long, with tobacco smoke reminiscent of a cigar, a bit of cinnamon, and a eucalyptus note at the tail end that brings everything together beautifully. With water....who am I kidding? I don't add water to this whisky. I just can't do it. It's classic and wonderful exactly as it is. Yes, I wish it was bottled a tad stronger, say 46%-48% abv. Yes, I wish Diageo would save the E150a (caramel colouring) for budget blended whisky and leave it out of my single malts altogether. But these are relatively minor quibbles. For me, Lagavulin 16 just hits the spot. While batch variations exist, I've been fortunate. Every bottle of Lagavulin 16 I've owned has been exceptional. The bottle of Lagavulin 16 currently residing in my whisky cabinet (and the one I’m reviewing here) was a gift from some very thoughtful people, so this particular Lagavulin is even more heart-warming than others I've had. I fully admit to being biased, so it's difficult to even feign objectivity where this whisky is concerned. It's an all-time favourite of mine. Oh, and excellent review as well @OdysseusUnbound. Sometimes we just dig a whisky and that's all there is to it! How big of a deal is the Ron Swanson thing, really? I've never heard of the guy outside of Lagavulin reviews, but it comes up in Lagavulin reviews a lot. @MadSingleMalt He’s a character from the series Parks and Recreation. He’s an über-serious libertarian who is understated, and generally ridiculous in a hilarious way. @OdysseusUnbound, I've never seen that show, but I do have a general idea of who this guy is—pretty much through the lens of passing comments in Lagavulin 16 reviews. :) That, and there's a fireplace video that circulates on the whisky web every Christmas, seemingly. I'm just wondering how big of a deal the whole thing is out in the real (non-whisky) world. Does he talk about Lagavulin 16 on the show? A lot? In commercials? Is it to the point where non-many whisky people don't really know what Lagavulin 16, except that it's the booze that some TV character talks about? @MadSingleMalt Ron Swanson doesn’t talk about it a whole lot on the show. Nick Offerman did a series of ads for Diageo called “My Tales of Whisky”. They’re pretty funny (or mildly amusing) if you like that dry, understated humour. And I do. Sadly, the last bottle of Lagavulin16 I bought, I had to give away 1/2 way through the bottle because it wasn't worth me wasting my time or liver on anymore. This is the whisky that truly got me into whisky 16 years ago but I'm done with with Deagio offerings until further notice. I'll take another chance in a few years if QC has improved. When this malt is spot on though, not too much beats it. @KRB80 Don't forsake all of Diageo. There are some good ones. JW Blue is very ssssmmoooooooottthhhhhh. Caol Ila is great, but I acknowledge some of my favourites are IBs. @KRB80 Unfortunately my bottle I had a little over a year ago was also not good. Shame because so many sing the praises of Laga 16. I would like to find a batch that people are always raving about.